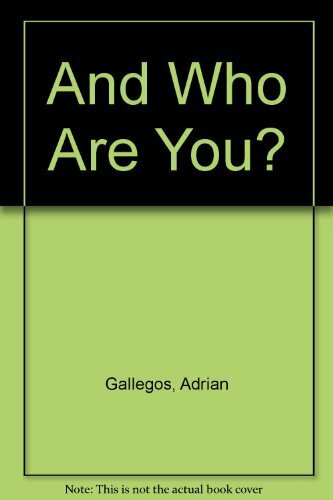 Home Gallegos, Adrian And Who Are You? Title: And Who Are You? Store is open to the public 10:00AM to 3:00PM Tues. thru Fri. Open Sat 10:00AM to 3:00PM. Prices net, postage extra. Dealers outside of the United States will be charged global priority Dealers please provide your tax number. Minnesota residents please add the appropriate tax. Items are returnable within thirty days of receipt. Please notify us in advance of returns. Orders are shipped promptly by book-rate mail. Orders usually ship within 2 business days. Shipping costs are based on books weighing 2.2 LB, or 1 KG. If your book order is heavy or oversized, we may contact you to let you know extra shipping is required. We no longer accept credit cards.